The most profitable, consistent and reliable marketing campaign for national advertisers is direct mail. In fact a direct mail campaign done right is the “Holy Grail” of direct response marketing. It can get customer’s attention, pique their interest in a product or store, pre-sell them with a well delivered sales pitch, and in some industries make the sale with no store involved. And yet, in the furniture industry, direct mail is one of the most underused media forms. Many independent retailers try one mailing, do it poorly and never want to try it again. In this installment of new media marketing, you’ll learn how to add pizzazz to your direct mail to get extraordinary results. People see numerous advertisements every week and receive countless flyers in a year. If you want to appeal to your customer you have to stand out and not do what everyone else is doing. The advertisements that are unique are always the most memorable. Bold measures stick in people’s minds. Today about mid-afternoon the postman will show up outside of the front door of your customer’s house like he does every day except Sunday. He will dutifully place whatever personal correspondence, subscription magazines and bills addressed to the family into the mailbox. This mail has interest to someone in the household and will go to a pile of mail to be opened and read. The rest of the mail consists of unsolicited mail like catalogs, Valpak and junk mail including numerous credit card solicitations. Unfortunately most furniture store solicitations fall in this 2nd category of unwanted mail. If a furniture store mailing piece cannot move from the junk mail pile to the opened and read pile, it will be destined to find the trash can. It will not make any difference how good the offer inside the envelope is, if the mail does not get opened and read. These days so many people just throw away what looks like junk mail without even opening it. When mailers become junk mail the company fails: the effort becomes a complete waste of money and the customer is left clueless about the message since the mail was never opened. A message that is not opened cannot be acted on. So how do you get your mail into the pile of mail that gets opened and read? Make your customers so curious about what is inside that they can’t wait to rip it open! To create curiosity, send your customer a mailing piece that is different from all others because it obviously has more than a letter inside. The best way to do this is called “Lumpy” Dimensional Mail, also known as 3D Mail. 3D Mail, is a piece of mail that has depth in addition to length and width. The depth is what sets a 3D mailer apart. A 3D mailer can be any number of things from a cylinder or a box to something simply stuffed into an envelope that makes it look lumpy. A piece of 3D mail stands out (literally) from the otherwise ordinary flyers that so many companies have fallen into the rut of sending out. 3D mail sparks a little bit of curiosity! Because of its unique shape, there is no way it can sit, let alone get overlooked in a pile with all of the other mail. For example, if you received a baby’s pacifier in an envelope in the mail there is no way you could stack all of your other mail on top of it. Given the shape of the pacifier or any other 3D mail object, it has to be on the top of the mail stack or the whole stack will fall. If your mail does not stack it simply won’t end up in the stack! This is a great feature of 3D mail that is sure to make it stand out from all other mail. There are some minor disadvantages such as the added cost to either design and produce the mailer yourself, or purchase a ready made product from a supplier. Mailing costs are also generally higher for 3D mail than a traditional flat mail piece. What is the magic That makes 3D mail work? People love to be entertained. People love to feel like things are personalized just for them, and they love things that are unique. This is just why 3D mail works: it serves all three of these purposes with just one mailing! It is entertaining and it gets your prospect or customer involved! When you actively involve your prospects, they’ll stay with your mailing longer. Any good salesman knows the more time you spend with your prospect, the more of your story you can tell, and the more you can sell! When you tie your sales message to 3D mail you’ll entertain your prospects and customer and keep them involved and sell more. 3D mail simply needs to be opened and read because it significantly increases response rates. An added benefit is that it’s different. If people get something out of the ordinary in the mail, it is likely they will show it to someone else because it’s innovative or humorous. Most importantly for you the retailer, 3D Mail is cost effective, especially if you take care to include light weight and inexpensive inclusions. Of course some industries go all out with expensive mailing pieces. But furniture retailers do not have to do that. Below are several examples where the extra little cost to make the mailing dimensional will give a far higher return on investment. The next key to making dimensional mail work for you is to tie the offer into why you are sending something odd in the mail to the customer. Work hard to create a believable offer and you will find great things will happen. 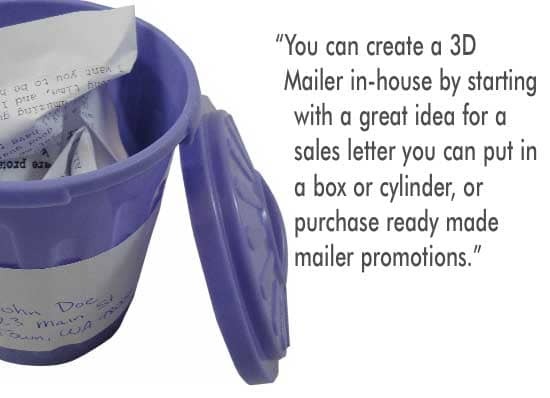 You can create a 3D Mailer in house by starting with a great idea for a sales letter or offer that can be put in a simple box, a cylinder or a custom made container. An amusing or “cute” message can be made more powerful by including an item that reinforces your message. You can find a number of ideas for this type of promotion later in this article. There isn’t any reason why you can’t adopt a more serious tone by including useful information or an item that reinforces your emphasis on color, design, comfort, service or materials. You can also purchase ready made mailer promotions. Some of the best dimensional response items are mailing pieces that you slap a label on and place a sales letter inside. Here are several ideas for 3D mailing promotions that have been successful for furniture retailers. You'll sleep like a Baby on a new mattress... I don’t have to tell you that Mattress sales are good business. Premium mattresses offer great benefits for the consumer and good margin for the retailer, so a direct mail campaign sent to affluent households can yield some great results. And what’s not to like about a pacifier. It’s not something that gets mailed out every day. It’s fun! And it will get results. Tie your message and mailing into “sleeping like a baby” and you’ll cry all the way to the bank. What's the Catch? When your offer is too good to be true, send them a toy fisherman pinball game with the Headline “What’s the Catch?” They can’t help but try it out. An added benefit is they will remember you every time they see the game. Save a fortune on new furniture... What’s not to like about a fortune cookie arriving at your house with the following message inside the cookie “Read the enclosed letter to find your fortune...” And then the letter starts off with the headline savings claim “Save a Fortune on New Furniture from (Your Name) Furniture Store”. You can also create a custom fortune inside the cookie. J. Squirrel - Are you Nuts... A classic direct mail letter for the second or third mailing of a sequence is the J. Squirrel letter that basically asks the question ‘Are You Nuts” for missing this sale. A copy of this letter along with further information on this sale can be found by checking out the free guide mentioned at the end of this article. Bosnia-Herzegovnia 100 Dinara Bank Note... Once in a while a letter will come with a penny or nickel or even occasionally a $1 bill. I’ll bet you never got a bright colored 100 Dinara Bank Note before. Nor has your customer and that’s what will get them talking about you. Attach this to the top of the Letter and use a headline like “I’ll Bet You’re Wondering Why I sent you 100 Dinara Bank Note” or “Trade this 100 Dinara for $100 off any purchase over $999”. There are countless ways to use this to attract attention. Develop a three step campaign for activating old customers who have not done business with you in a while. Old customers are always a source of new business. Sometimes, people forget you, or had a bad experience, or any number of reasons they might have stopped doing business with you. Go back through your files and start this three step mailing sequence. Step 1: We Want You Back!!! The Boomerang letter. Who wouldn’t think twice about a business that sends out boomerangs with a letter headlined “We want you back”. A customer who gets this unique item in the mail will think it’s fun, and if they have kids, you just gave them something for the kids to play with so they will think kindly about your store. Step 3: This is the Last Time I'm Going to Bug You!!! Use the Bug Letter for the third sequence of the lost customer campaign. Build the mailing piece around the theme of “This is the Last Time I am Going to Bug You”. The multi-step mailing is a great way to break through the clutter. With dimensional mail like this, your mailing piece is bound to get opened. A multi-step campaign always outperforms a single letter. After your customer has received a couple of these fun dimensional offerings, they will become interested in what you will send them next. This automatically moves your mail from the “junk” pile to the “I want to read” pile. There are a number of companies that produce ready-made or custom dimensional mailers. Find them by doing an internet search for “3D Mail”, “3 Dimensional Mail” or “Dimensional Mail”. Note: You can request useful guide that provides 3D container ideas and copyright-free generic sales letters at www.FurnitureResponse.com, the website of 3D Mail Results, a supplier of 3D mailers. If you have questions about this article or other marketing topics, email mroot@furninfo.com or visit www.MikeRoot.com.